This might appear similar to a Composite Structure diagram, which also models run-time behavior; the difference is that Object diagrams exemplify the static Class diagrams, whereas Composite Structure diagrams reflect run-time architectures different from their static counterparts. An Object diagram can also be a kind of Communication diagram (which also models the connections between objects, but additionally sequences events along each path). You generate Object diagram elements and connectors from the Object pages of the Toolbox. 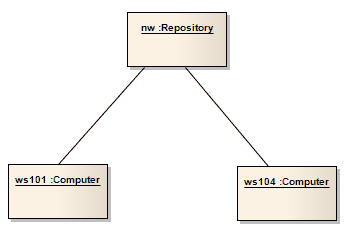 This example shows a simple Class diagram, with two Class elements connected. These Classes are instantiated as Objects in an Object diagram. 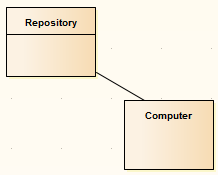 There are two instances of Computer in this model, demonstrating the usefulness of Object diagrams in considering the relationships and interactions Classes might have in practice. An Actor is a user of the system; user can mean a human user, a machine, or even another system or subsystem in the model. An Object is a particular instance of a Class at run time. A Collaboration defines a set of cooperating roles and their connectors. Use a Collaboration Use to apply a Pattern defined by a Collaboration to a specific situation, in a Composite Structure diagram. An Information Item element represents an abstraction of data, which data can be conveyed between two objects. An Information Flow represents the flow of Information Items (either Information Item elements or classifiers) between two elements in any diagram. Dependency relationships are used to model a wide range of dependent relationships between model elements in Use Case, Activity and Structural diagrams, and even between models themselves.